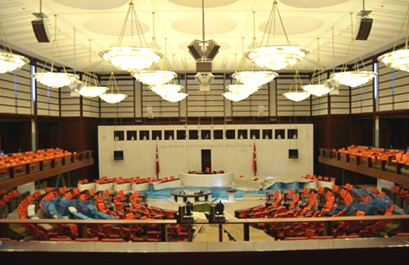 The plenary hall of the Grand National Assembly of Turkey had been completely renovated in the years 1996 - 1998 as planned by ADA. First, in a study for the responsible technical department of the building, the need for the renewal of the conference and audio systems, as well as the related display / presentation systems was pointed out. As a first step, the sound reinforcement system was completely replaced. The main loudspeaker systems are now based on line arrays, which are acoustically supported for the large visitor's gallery with other smaller subsystems. A new localization system has been created over the deputies' seats, which can now be perceived from four zones according to their place. New digital mixer console, and an accordingly large extended audio matrix with a new higher-level control system complete the installed system.